When you create a new site from a site template, Web Parts are automatically added to the site home page. For example, a team site includes Announcements, Calendar, and Links Web Parts. These Web Parts are instances of the List Web Part that use a preconfigured list template to display list data. Similarly, when you create a list or library on your site, a Web Part of the same name as the list or library is automatically created. For example, if you create a list called Contracts, a Web Part called Contracts will be available in Site contents. The Web Part automatically displays the data contained in the list or library that you created. After you add a list or library Web Part to a Web Part Page, you can customize the view to show only the information that you want to display on the page. You edit the current view from the Web Part Page. You can also create custom views of a list or library, which you can use to display different sets of information in different instances of the Web Part for that list or library. You create custom views of a list or library by using the View menu on the list or library that you want to customize. In the Quick Launch bar or on the page, click the Listtitle that you want to customize, and then click the List tab on the ribbon. If the view you want to customize is showing, click Modify View in the ribbon. If it's not showing select the view you want under Current view, and then click Modify View. 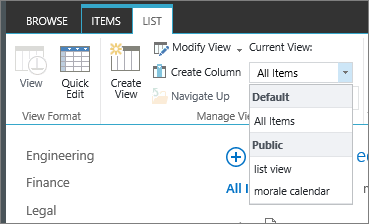 In the Columns section, you can show or hide columns by selecting the appropriate check boxes. Next to the column name, enter the number for the order of your column in the view. In the Sort section, choose whether and how you want the information to be sorted. You can use two columns for the sort, such as first by author, and then by file name for each author. In the Filter section, choose whether and how you want to filter the information. A filtered view shows you a smaller selection, such as items created by a specific department or with an Approved status. In the Tabular View, choose whether you want a checkbox on each row or not so you can make multiple selections in the list. In the Group By section, you can group items with the same value in their own section, such as an expandable section for documents by a specific author. In the Totals section, you can count the number of items in a column, such as the total number of issues. In some cases, you can summarize or distill additional information, such as averages. In the Style section, select the style that you want for the view, such as a shaded list in which every other row is shaded. Under Folders, you can choose Show items inside folders to support folders in the your list or library, or Show all items without folders to show everything at the same level. For theItem Limit section, you can limit how many files are viewed on a page, and whether they're shown in subsequent batches, or just that number items. If you plan to view the list or library on a mobile device, select the options that you want in the Mobile section. 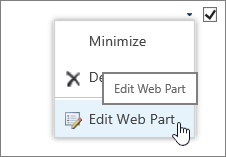 You can connect a Library or List Web Part to another Web Part, provide data to it, and change the way the data is displayed in the other Web Part, including another List Web Part. On the Settings menu , click Edit Page. If necessary, add the other Web Parts to the page that you want to connect to. Locate the List Web Part on the page or add the List Web Part to the page. Click the Web Part menu down arrow,, and then point to Connections. You can connect one Web Part to another Web Part by passing a selected row of data to the other Web Part. Depending on how the other Web Part was created and gets the data, the other Web Part might display the row data or use the row data as a filter or parameter value. In standard view, a Select Item column containing option buttons is automatically added when you connect the Web Part, so that you can indicate which row to pass to the other Web Part. You can select only one row at a time in standard view. Some columns, such as the Edit column, are not available for use in a Web Part connection. In datasheet view, you can select multiple rows, but only one row is passed to the other Web Part. If multiple rows are selected, the row containing the active cell is passed to the other Web Part, and all other rows are ignored. You cannot provide data in the Total row or New row to the other Web Part. With this type of connection, you can have more than one Web Part connected to the Web Part. You can connect a Web Part to another Web Part that works with list data. In this case, the first Web Part is the data source for the second Web Part. In standard and datasheet view, only the data in the view is provided to the other Web Part. One or more column name and value pairs of data that filter data in the Web Part. A column of data to sort data by either ascending or descending order in the Web Part. With this type of connection, only one other Web Part can be connected to the Web Part. All the Web Parts on your site are usually available in Site contents. When you first add a list or library Web Part from Site contents to a Page, the Web Part Page displays the default list view. To display the data that you want in the List Web Part as well as the other connected Web Part, you may need to edit the view of the list. For example, you may want to filter, sort, or group data a different way or display different columns. Select a different view from the Current View property. Click Modify View to edit the current view. Whenever you select or edit a list view, a copy of the list design is made from the original site list design and saved with the Web Part. However, the list data remains the same. Although you can display all list types in a List Web Part, only certain list types are supported when you make a Web Part connection. In general, list types that display data in tabular format, such as Contacts, are supported. Lists that display data in a nontabular format, such as folder view, are not supported. The supported and unsupported list types are listed below. Although you can display all list column types in a List Web Part, only certain list column types are supported when you make a Web Part connection. The supported and unsupported list column types are listed below. Click Settings and then click Edit Page. Use to enter XSLT source code into a plain text editor. Knowledge of XSLT syntax is required to use this editor. Select to disable client-side rendering of the Data View Web Part. This also hides the Disable view selector menu, Disable "Save This View" button, and Display Search Box properties. Show or hide the View Selector menu … above the list column headers. Show or hide the Save This View button above the list column headers. By default, this button appears when you change the current view by filtering or sorting it. Show or hide the list or library Search box above the list column headers.